The digital eyewear samples demonstrate how to develop and configure Vuforia apps for both optical and video see-through Digital Eyewear. The stereo rendering sample will show you how to configure a stereo display for your Vuforia apps. This sample is applicable to supported optical see-through devices supported by the Vuforia SDK. The AR/VR sample will show you how to develop AR/VR mixed reality experiences for video see-through devices that can seamlessly transition between AR and VR modes within the same app. Activate Vuforia AR Support and VR Support in XR Settings for your project. Add Vuforia as the 1st VR SDK for your project - this option is presented once you activate VR Support in XR Settings. Select Import for the sample in the Unity Asset Store. Accept all of the sample assets from the Import dialog. 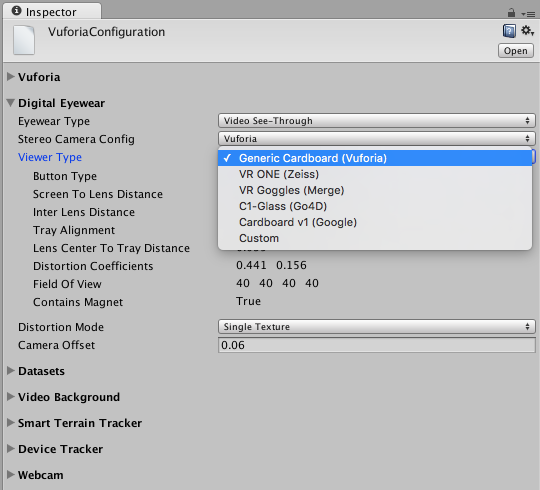 Search for "Vuforia Stereo Rendering for Digital Eyewear" in the Unity Asset Store. Download and import the sample into Unity. Because this is a complete project, Unity will prompt you to create an empty project if you already have content. Ensure the latest Android SDK has been installed and that its location has been defined in the Unity Editor ( Unity > External Tools > Android SDK Location ). For ODG and HoloLens, ensure that you have configured the drivers for your eyewear device on your computer following the instructions provided by the manufacturer. But this step isn't necessary for phone-based stereo viewers such as Merge. Connect the device to your PC/Mac and check that the command adb devices results in a log that shows that it is connected. Add your scene(s) to Scenes in Build. Define a unique Bundle ID in Player Settings > Other Settings. Define a unique Product Name to serve as the name of the app when installed on a device. Select Build to generate an executable or Build & Run to both generate an executable and deploy it to a connected device. You may be asked to specify the location of the installed Android SDK configured your Unity installation for Android already. 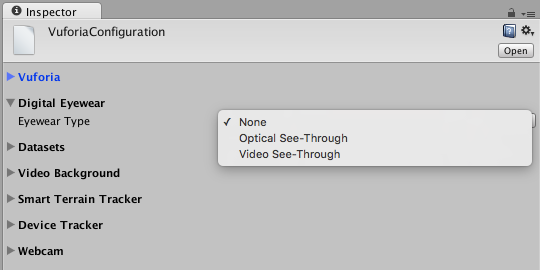 There is no need to change any of the default Player Settings to support Vuforia SDK for Digital Eyewear. You can customize the presentation of your app on the device by adding icons and splash images in Player Settings and setting the app s device orientation. When running the sample on a device you should see a stereo rendering of the AR content with a different image delivered to each eye. The video background will be turned off. The devices will be switched to 3D mode by Vuforia prior to showing any augmentation. 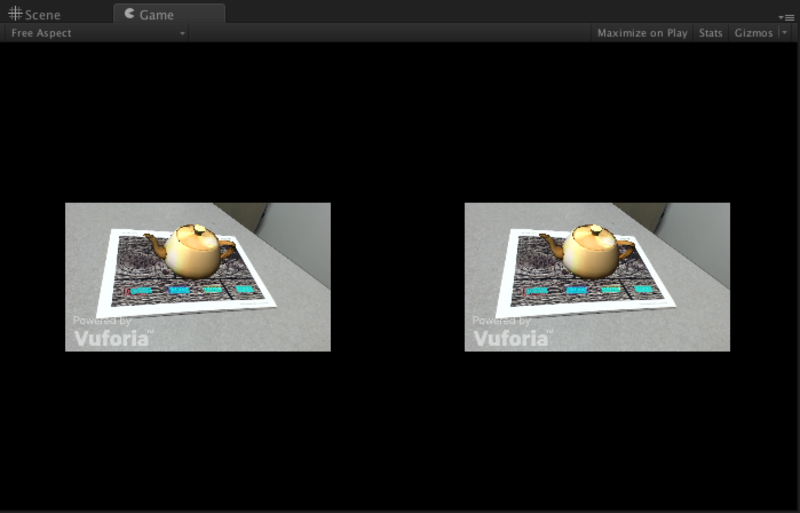 The stereo rendering sample for Unity demonstrates how to configure a Vuforia Unity scene for stereo displays, to support both optical and video see-through digital eyewear apps. This article highlights the Game Objects and script components that are significant to enabling stereo rendering and describes the configuration options that can be used to customize stereo rendering in a scene. Open the scene named "2-StereoAR" in the "/Scenes" folder. The sample scene depicts four Image Targets configured using the default Data Base. Each Image Target has a corresponding 3D Model or Particle system. App License Key Add a license key when you're ready to customize the sample with your own targets. Stereo Camera Config Indicates which stereo camera rig to use, support is provided for Oculus. The default is the native Vuforia camera rig. Viewer Type Defines which AR/VR Viewer to use from a selection of supported viewers, including Merge VR, and also a custom, developer defined, viewer type. Camera Offset Defines the distance between the stereo viewports. This setting can be used to set IPD and also to adjust eye convergence for scenes with subject matter that is very close. Follow these instructions to configure the Digital Eyewear section of the VuforiaConfiguration asset to support either Optical or Video See-Through head-worn eyewear devices. These settings will configure your project for stereo rendering and also enable you to specify whether Vuforia should utilize the functionality for a 3rd party AR/VR SDK. 1. Add an ARCamera instance to your scene. Selecting either Optical or Video See-Through will add a pair of stereo cameras to your ARCamera hierarchy. After setting the Eyewear Type to Video See-Through, you can specify which Stereo Camera Configuration to use. This setting enables you to bind the Vuforia ARCamera to the camera rig of a 3rd party SDK, such as Oculus. 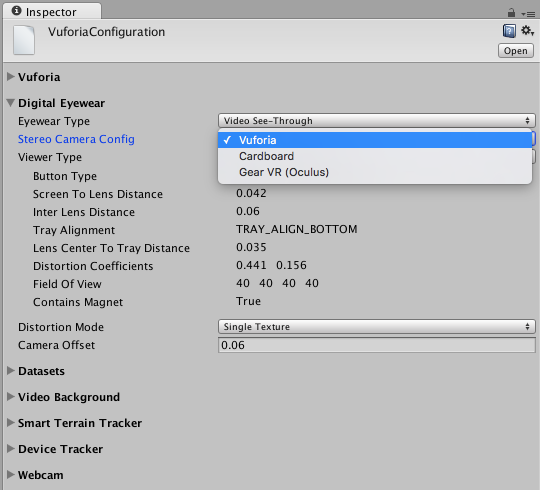 If you aren't utilizing a 3rd party SDK with Vuforia, you can simply use the default Vuforia Stereo Camera Config. Select the See Through Configuration for the eyewear device you are using. If you don't see a configuration specific to your device make and model, select the Vuforia configuration. Now define which Viewer Type you are targeting - again, this only applies to Video See-Through eyewear. The camera offset should correspond to the interpupillary distance that you want to simulate in Play Mode and for apps running on devices. The interpupillary distance (IPD) is the distance between the centers of the pupils of someone's eyes. Typical IPD values for adults is between 54 and 68mm. Note: Camera offset has no effect in apps running on optical see-through devices. The size and offset distance of the stereo viewports for camera see-through devices can be configured using the Camera Offset field in the VuforiaConfiguration asset which is accessible from the ARCamera's Inspector panel via the Open Vuforia Configuration button. You can also search for VuforiaConfiguration in the Project panel. Camera Offset defines the distance between the stereo viewports in scene units (mm) and can be used to define an interpupillary distance ( IPD ) for the user. Camera Offset is only applicable to video see-through applications, and has no effect on optical see-through devices. The Camera Offset can be adjusted at runtime in Play Mode to evaluate the effect of different settings. The following example uses a camera offset of 42mm and a scale factor of 0.32.